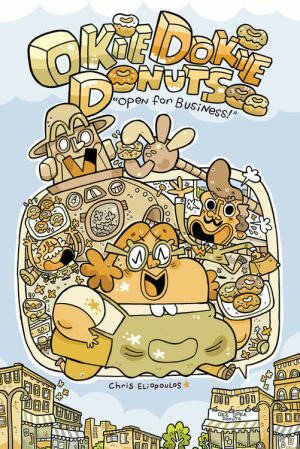 Okie Dokie Donuts: Open for Business is a recent graphic novel and children’s book from Chris Eliopoulos. This full-color, 5” x 7.5,” hardcover book is the story of a portly matron who owns and operates a hugely popular donut shop. Okie Dokie Donuts may be the best little donut shop anywhere. People line up outside the shop for its treats. Baker and owner, Big Mama, does practically everything by hand and from scratch, but she could use a little help. In walks kitchen appliance salesman, Mr. Mayweather, who is in the employ of the “Great Cooks Cooking Corporation.” Mayweather swears that the corporation’s latest contraption, Mr. Baker (Brilliant Apparatus Kooks Every Recipe”), will help Big Mama because it can cook “over 1000 donuts in 40 seconds.” This oven-like robot may do just that, but when it is through, Big Mama and Okie Dokie Donuts may be through as well. Okie Dokie Donuts: Open for Business opens with a musical number (or the comic book version of one), so I knew I was in for an unpleasant reading experience. But I wasn’t. Okie Dokie Donuts is not just a cute kids’ comic book, but it is also simply a funny tale. Chris Eliopoulos makes comedy out of the unappetizing idea of the mechanization of food, which is the current status of our food processing. Of course, Mayweather’s robot can work, but without the ability to “think on one’s feet” or troubleshoot the unexpected, the robot is just another thing in the way – a disruptive nuisance. Okie Dokie Donuts slyly preaches for hard work and making things with one’s hands, but uses vibrant colors and comic book graphics to deliver an entertaining message. Okie Dokie Donuts has the manic energy and sarcastic charm of a Marx Bros. movie, so don’t sell it short. You don’t have to be a kid to enjoy this sweet treat.